About half way through my pregnancy when I was searching for things to decorate the nursery with I kept stumbling upon wooden abacus toys. 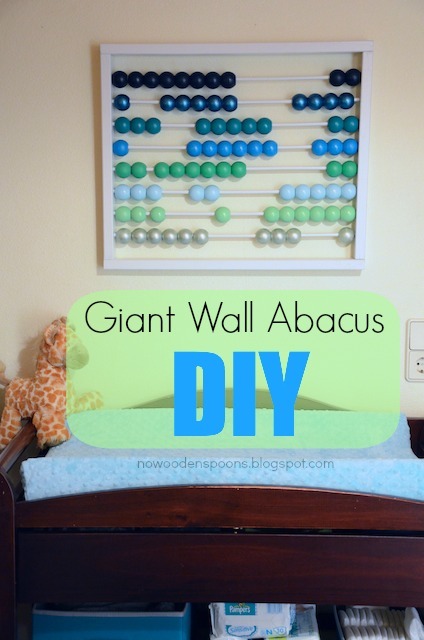 I liked the idea of making a giant wooden abacus for his wall above his changing table. For a while I wasn't sure how I was going to make it, but then with some help from my husband it all came together. This really became a family project with everyone helping, even Ariana painted some beads. I really love how it turned out and wanted to share how we made it. It's not as hard as it looks and it's great because you can customize the colors to match whatever room you are displaying it in. - Piece of wood measuring 1.75 x 1in and at least 84 inches long - cut into 4 pieces total. 2, 18 inch pieces and 2, 24 inch pieces. - Wooden dowels. We got our from the local hardware store 8mm/0.25inch in diameter and 23 inches long. We used 8 dowels. Newspaper or wax paper (for drying your painted wood on). Note: Our giant wall abacus measures 24x18, and has 8 rows of beads. The following directions are for this exact abacus. If you want your abacus smaller or bigger use these directions as a starting off point. 1. Once you've bought all your supplies make sure your wood is cut to the sizes you need. Remember you will need 2, 18 inch pieces for the sides of your frame and 2, 24 inch pieces for your top and bottom. Your dowels need to be cut to measure 23 inches long. 2. On your 18 inch pieces of wood (your sides) use your ruler and make a mark in the center of your wood at the top and bottom. Using your ruler, connect the marks and make a line running down the center of your wood. Along the center line measure length wise and make 8 marks, 2 inchs apart. This is where you will drill holes for your dowels to go. 3. Make a mark 0.5 inch down on one of your dowels. Using your drill, along the marked spots, drill about 0.5 inch down on each piece of wood. Be careful to make sure the holes are straight and centered on each point that you made so they are centered. Check the depth using your dowel with the 0.5 inch mark. Your drill holes have to be at least 0.5 inches deep but it's okay if they are a little deeper. 4. If you need to, using the sandpaper, sand any rough edges you have on your wooden frame pieces and dowels. My wooden beads came very smooth so they didn't need any extra attention. 5. Now you can start painting! Painting your frame pieces white and your beads the colors of your choice. Each row will have 10 beads of a certain color. We made 8 rows of 10 beads each, so we used 80 beads in total. Add a second coat as needed. Let them dry as directed. 6. Once all your pieces are painted and dry, outside or in a well ventilated area, use your clear spray paint to give them some shine. We only had to use this on our beads. The white paint for our frame was a semi- gloss and we thought it looked okay like it was. More drying, more waiting. This was the worst part. 7. You're almost done! Nail together one of your short pieces of wood to both of your long pieces. Then stick the dowels into the holes on the short piece of wood. 8. 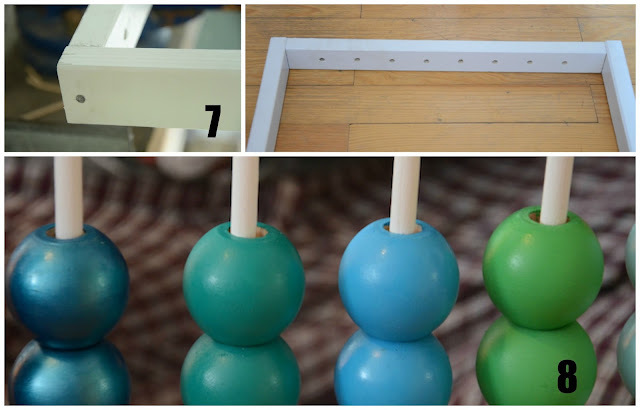 Thread your beads onto the dowels in the color pattern you want. 10. 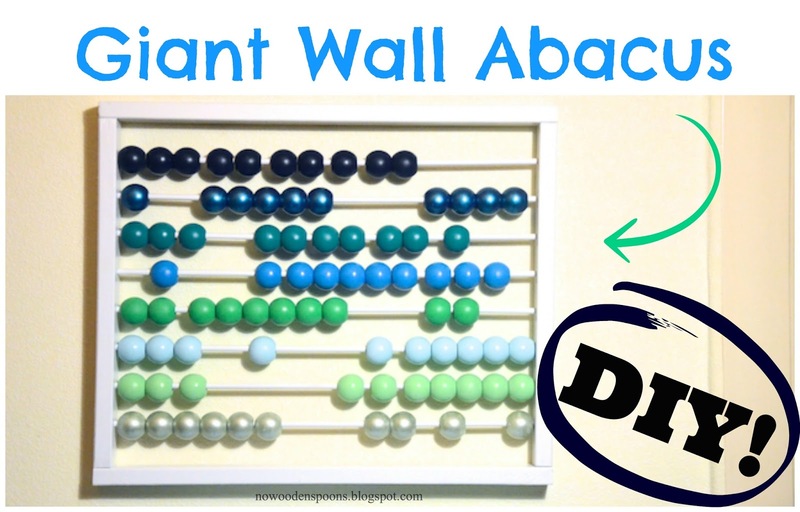 Attach a hanger on the back of your abacus and you are done! We used 3 sawtooth hangers on ours because it's pretty heavy. Hang and enjoy! **Note this abacus is not made to be baby proof. This is for decoration only. That is so cool, Catherine! I absolutely love it. Great project - thank you!